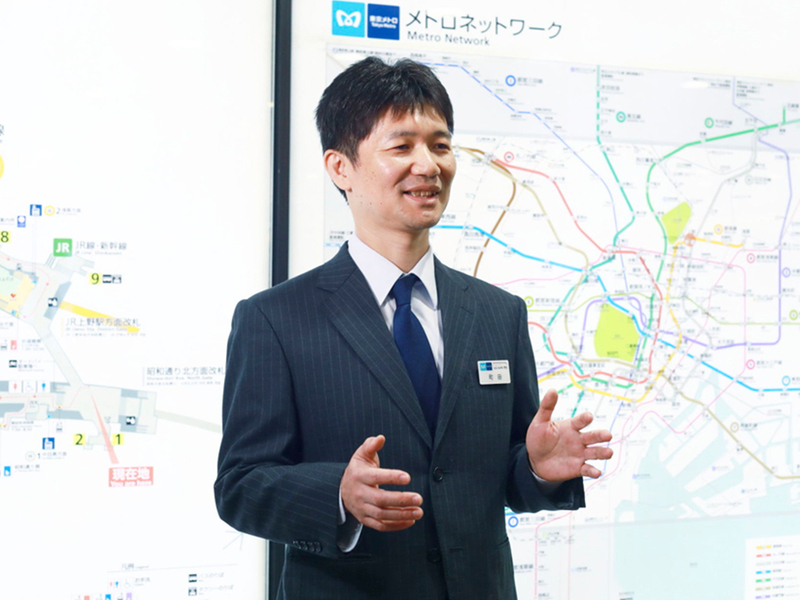 As climate change increases the possibility of flooding, Tokyo Metro is working to minimize the disruption of subway operation. Modern urban subway flood control is backed up by advanced space technology. 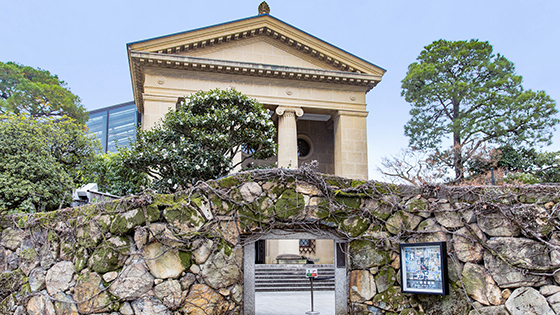 Nowadays damage from extreme weather, such as ambushes of “guerrilla rain,” is increasing, and major floods are being reported around the world. 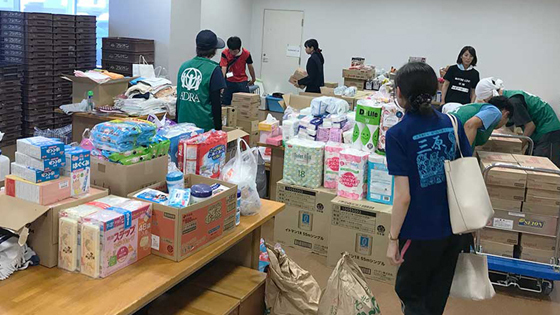 Tokyo Metro Co., Ltd, the corporation that manages many of the subways running underneath Japan’s capital city, continues to strengthen its preparations to prevent flooding. 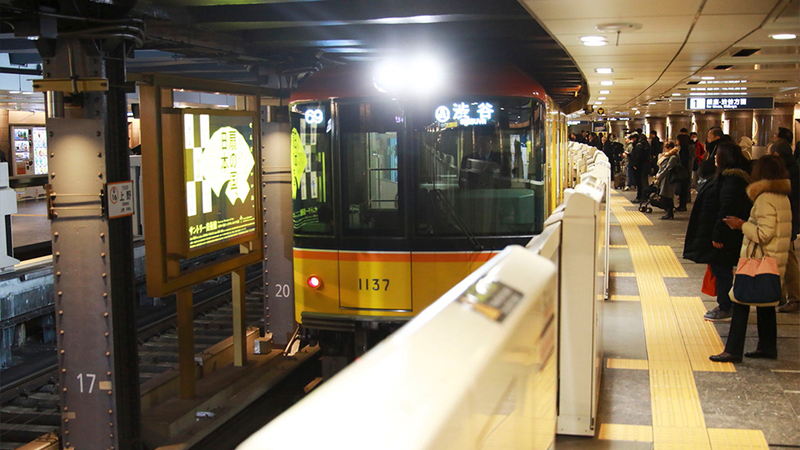 Tokyo’s subways are a vital transportation link for travelers too. 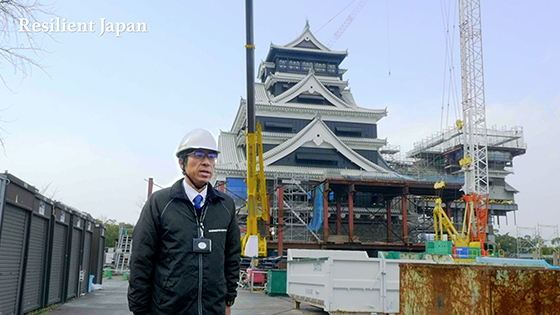 Various flood control measures have been designed to keep them operating even during torrential rains and typhoons. As an example, consider the antiflooding mechanism for sealing the ventilation ducts drawing air from street level. The conventional method could withstand the equivalent of a 2-meter depth of water pressure, but a new model, able to withstand pressures of 6 meters of water, has been installed in areas with high risk of flooding. In addition to increasing the number of flood barriers, the entrances of stations are being rebuilt according to a completely flood-proof design, which can be sealed by closing water-tight doors. Flood gates are also being installed in the entrances of tunnels, where train tracks on the surface descend underground. Thus preparations have been made to prevent ingress of water from all possible entry-points. An action timeline (disaster response plan) to deal with major flooding has also been instituted. 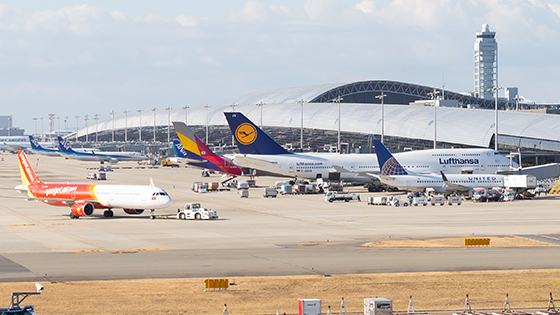 Calculating from the time predicted for an incipient disaster, the plan specifies a sequence for determining how far in advance trains should stop operation, so that the evacuation of passengers can be completed. By preparing a plan, the interruption to subway service is kept to a minimum. 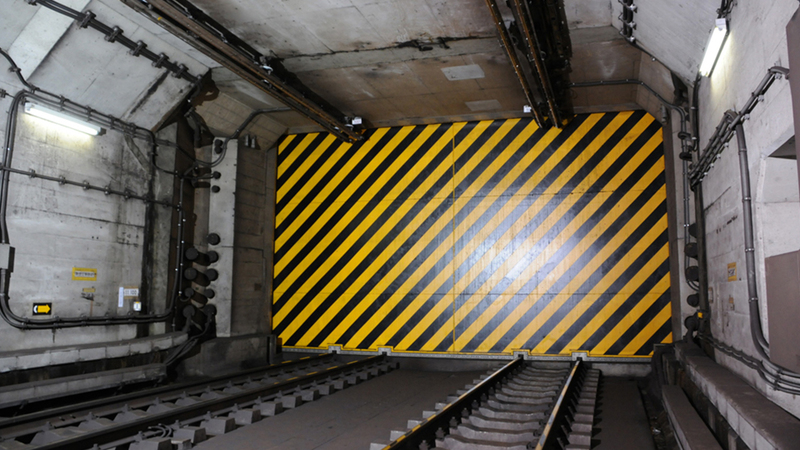 Flood gates have been installed to seal off the entrances of tunnels through which trains pass as they go from above-ground to below-ground tracks. Even if some water gets inside, water drainage pumps will expel it from the tunnels. 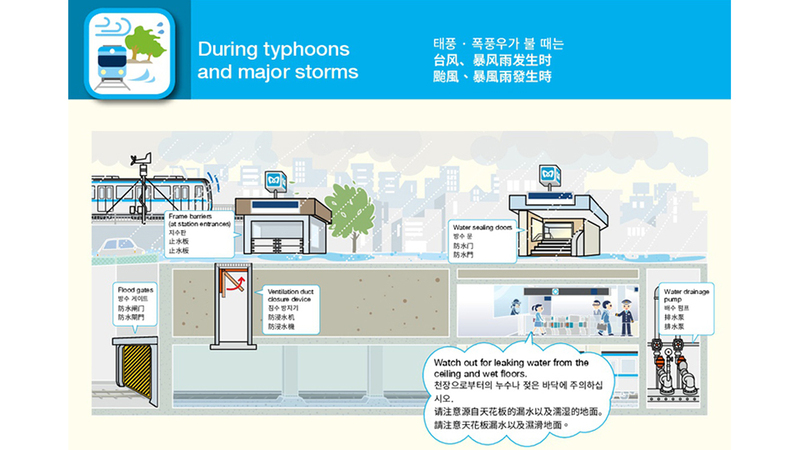 The safety guide issued by Tokyo Metro in several languages provides easy-to-understand illustrations of its flood countermeasures. This helps passengers remain calm and continue riding the trains. The trick is to ensure safety without leaving people stranded far from home—decision-making in this situation depends crucially on the accuracy of weather forecasts. An international effort, the Global Precipitation Measurement (GPM) mission has been instituted, in which data acquired by satellites of different nations are shared in order to observe precipitation on a global scale. 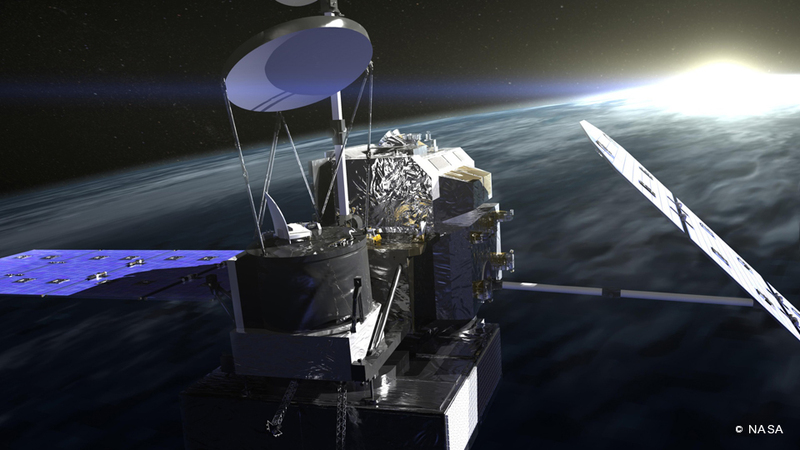 The GPM satellite at the core of this mission carries Dual-frequency. Precipitation Radar (DPR), one of the world’s most advanced meteorological instruments, developed by the Japan Aerospace Exploration Agency (JAXA). By emitting radio waves in two different frequencies, DPR can measure the distribution of rain in 3D. During the torrential rains in September 2015, the DPR measured precipitation data over the ocean, which land-based measurements could not cover, resulting in forecasts that were much closer to the actual event. The GPM Core Observatory, developed jointly with NASA, uses JAXA’s most advanced technology to generate precipitation maps of the entire world. 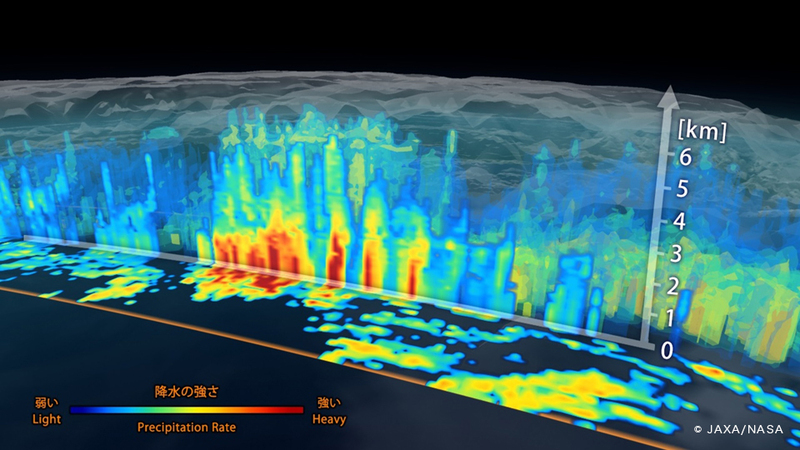 A 3D rainfall distribution map generated by the Dual-frequency Precipitation Radar (DPR) developed by Japan. DPR is able to measure rainfall over the entire world, without any gaps in coverage. The usefulness of data shared between nations through the GPM mission is not limited to predicting torrential rains. One application is to offer a global rainfall map (GSMaP) in real time. 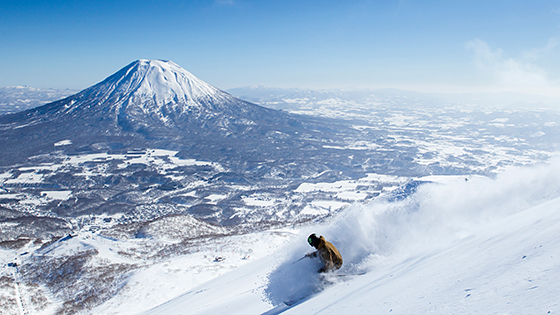 The number of countries that have a land-based observation system giving them full coverage, such as Japan, is limited. 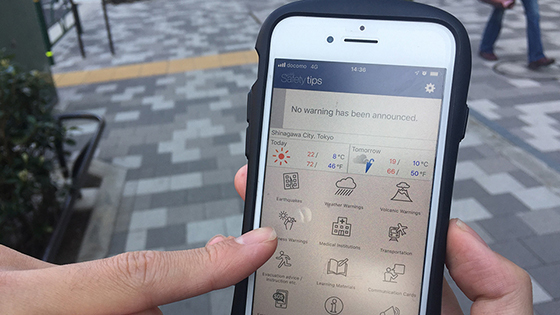 According to Oki, GSMaP is being used by countries that do not have a full observation network to monitor their rainfall and predict local floods. 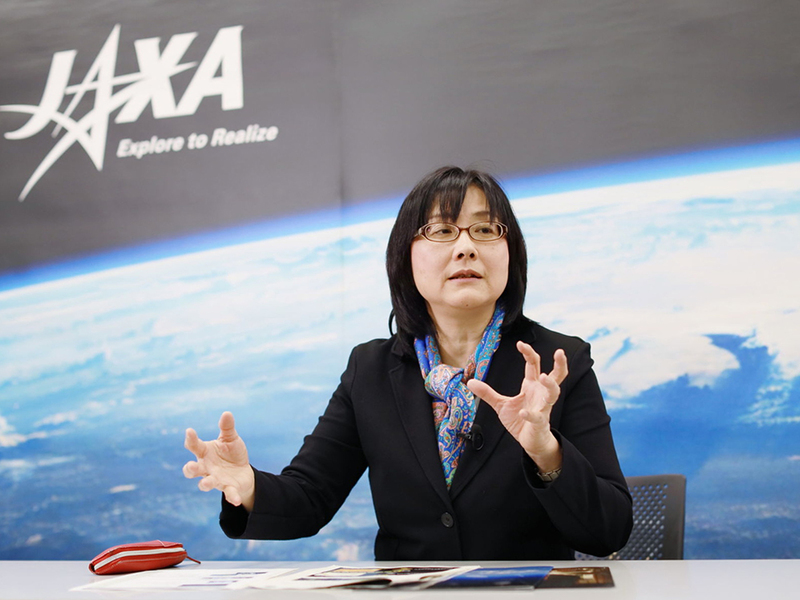 Oki, a senior researcher at JAXA, says that because DPR acquires data about the amounts of water in vertical columns (three-dimensionally), it’s easier to assess weather phenomena in real time. She further observes, “Information about rainfall is immensely important for the global environment. 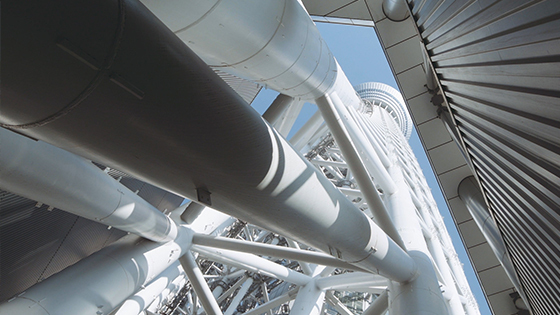 The data acquired through the GPM mission benefits not only Japan but the entire world.” Thus precipitation data acquired from space using leading-edge technology is protecting Tokyo, and the rest of the world, from disaster.